THE YOUNG AND PRODIGIOUS T.S. 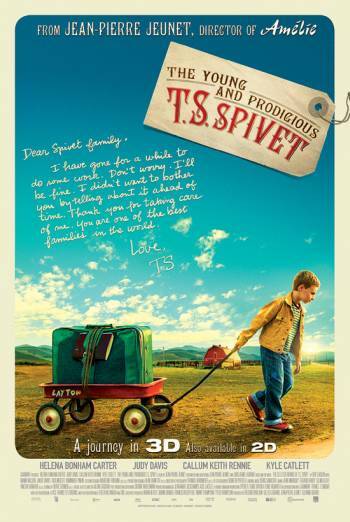 SPIVET is a comedy drama about a child genius who runs away from his family's Montana farm to accept a prestigious science award at the Smithsonian Institute. It contains two uses of strong language (f**k), both said in frustration, by the same character in the same scene. The film also contains the discriminatory term 'spaz'. There are also scenes in which the young protagonist plays on railway tracks and another scene in which his mother empties a cup of water of a flaming toaster. This film was seen for advice, prior to formal submission. The company was informed that the likely classification was 15, but that their preferred 12A could be achieved by removing a single use of the word 'motherf**ker'. When the film was submitted for formal classification, this word had been replaced and the film was classified 12A.